With plentiful okra, gumbo can’t be far behind. I’ve been avoiding gumbo since I typically make it with a dark roux — oil and flour cooked slowly to a dark chestnut color — which thickens and flavors the stew. 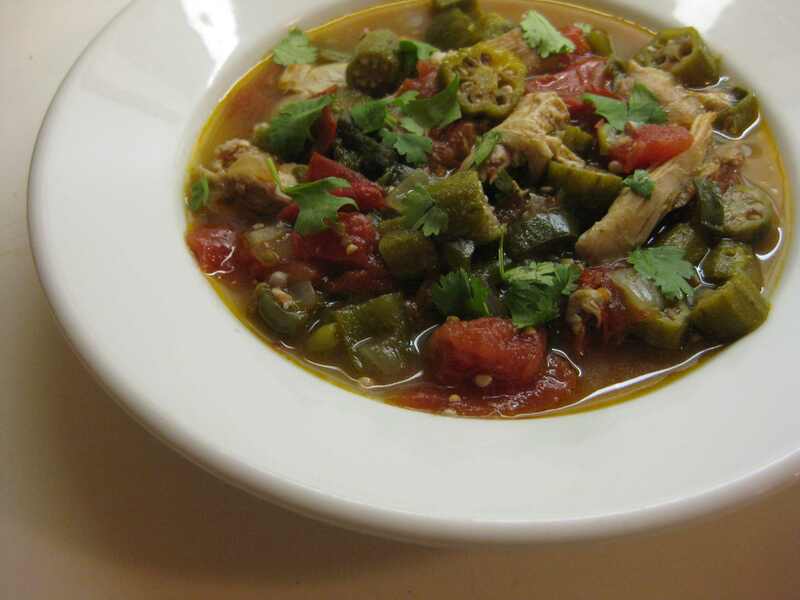 But with wheat-free people in my life, I’ve been preparing simple chicken and okra stew, allowing the okra to thicken the liquid. I pick the okra fairly small and since it’s so fresh, it doesn’t develop the characteristic slime that turns many away from eating the vegetable at all. 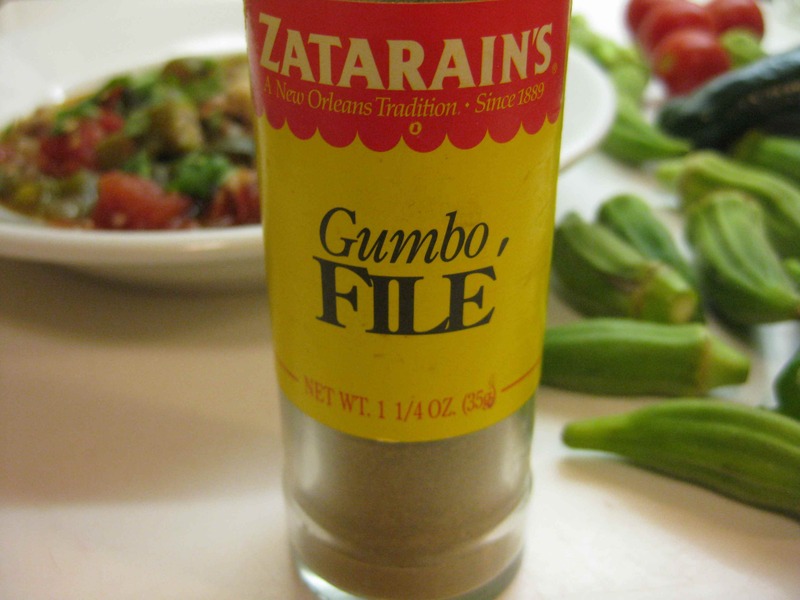 Then I remembered that I have a small jar of filé powder in my pantry, which is a great solution, and traditional in New Orleans and other havens for gumbo-lovers. Filé powder is made of ground leaves of the sassafras tree and acts as a natural thickener. Unlike roux, which is made at the beginning of the gumbo process, filé powder is added at the very end, after the gumbo is fully cooked. It instantly thickens the liquid, deepens the color and adds a subtle, earthy flavor. Now I’m going to figure out other dishes that it can thicken gluten-free and hassle-free. Salt and pepper the chicken and brown it in olive oil over medium high heat. Remove to a platter. Pour off all but a couple of teaspoons of oil and add the onion and peppers, cooking them over medium heat until the onion is wilted. Add the tomatoes and cook for a few minutes until they start to render their juice. Add the okra, stir to combine and nestle the chicken into the vegetables. Add chicken broth about ¾ way up the sides of the pan, cover and simmer until the chicken is cooked, about 30-35 minutes. Remove the chicken, skin it and cut it into pieces, returning it to the pan. If you’re not serving this right away, let the chicken and vegetables cool separately and then combine them to store in the refrigerator. Skim any excess oil from the surface. To finish the stew, heat the chicken and vegetables and add the filé powder. The stew will darken and thicken. Garnish with torn cilantro leaves and (optional) sliced scallions. Adjust the seasonings, adding hot sauce if you like it spicy. Serve over rice.